Introducing Breakthrough Silicon Valley’s largest graduating class yet! 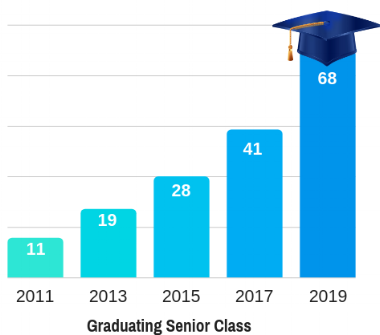 Joining us nearly six years ago, the Class of 2019 represents a very special moment in our organization’s history. Next June, we’ll celebrate the graduation of our inaugural Franklin-McKinley School District cohort, formed during our expansion into East San Jose. For the first time, our graduating seniors will include students from TWO San Jose school districts, for a total of 68 graduates! Your support has allowed us to significantly grow, serve more students from diverse communities, and shepherd more bright young people through the doors of higher education. This Giving Tuesday, the Class of 2019 and their peers NEED YOUR SUPPORT! Our high school program prepares students for success in college through many enriching experiences. Your gift will fund crucial opportunities such as the Southern California college tour, SAT/ACT prep, academic tutoring, regular meetings with college counselors, and monthly workshops on topics such as: course and major selection, financial aid, personal statement writing, and more. A gift of any size makes an impact, allowing us to provide valuable experiences to our students that may otherwise not be avaliable to them, through their school or other means. Thank you for supporting college dreams! "I am currently enrolled in an organization at my school called the Mitty Advocacy Project. Here, students can directly take action in order to live in a just world… In Spring of 2018, I applied for and was selected to travel to Sacramento along with 14 other students with hopes to persuade California’s legislators to pass a variety of bills related to immigration, criminal injustice, human trafficking and environmental/animal rights. I had the pleasure of individually working with Assembly Members Mark Stone and Ash Kalra." "In my freshman year, I was presented with an opportunity to join AllStars United [and] was instructed to create educational curriculum and videos...to offer easy to access education to children in low-income areas...so all children could get what they deserved…I became part of a movement much larger than myself, a movement that has the possibility to impact the whole world in the years to come." Be part of the movement that’s helping to prepare tomorrow’s leaders, CEOs, entrepreneurs, educators, elected officials, and more!